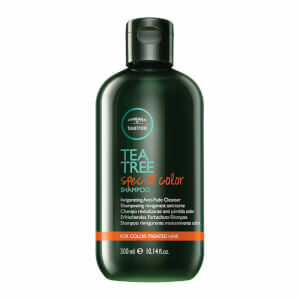 Gently refresh colour-treated hair with the Tea Tree Special Colour Shampoo from Paul Mitchell. Fortified with Peppermint and natural Tea Tree Oil, the rejuvenating formula effectively eliminates impurities and product build-up, whilst soothing the scalp and protecting hair from colour fading. Expect clean, fresh locks with ultimate vibrancy and a subtle Lavender fragrance. Vegan. Paraben and gluten free. Aqua (Water, Eau), Sodium Lauryl Sulfate, Sodium Laureth Sulfate, Cocamide Mipa, Parfum (Fragrance), Melaleuca Alternifolia (Tea Tree) Leaf Oil, Aspalathus Linearis Leaf Extract, Panthenol, Cocamidopropyl Betaine, Oleamidopropyl Betaine, Maltodextrin, Propylene Glycol, Glycol Stearate, Peg-150 Distearate, Menthyl Lactate, Glycerin, Polyquaternium-7, Citric Acid, Tetrasodium Edta, Sodium Chloride, Sodium Sulfate, Methylchloroisothiazolinone, Methylisothiazolinone, Magnesium Nitrate, Magnesium Chloride, Sodium Benzoate, Linalool, Limonene, Citronellol, Hydroxycitronellal, Ci 16035 (Red 40).